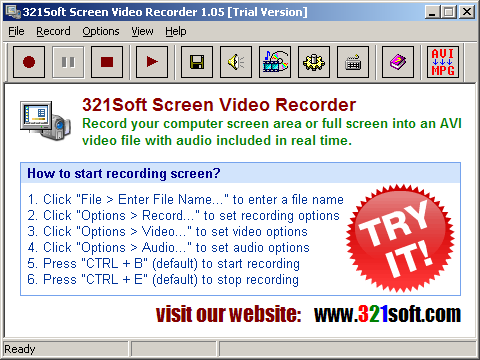 321Soft Screen Video Recorder is perfect for making training document, software demo video, slide show movie, etc. Your may run your software or document on your screen step by step, then record the whole procedure into AVI file. If you like you may speak and record audio simultaneously. And you may even record your mouse click with an enhanced effect so that when others watch your video may pay attention to the mouse moving tracks and clicking points, this is very useful to users who will use it to make software training documents. And you may also add some text on the video that you recorded to protect your copyright from being pirated. How to start recording screen?